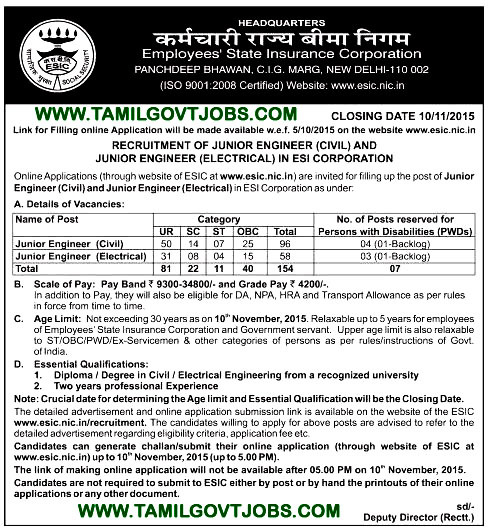 Applications Are Invited For Junior Engineer Civil And Junior Engineer Electrical Posts In ESI Corporation. Junior Engineer Civil - 96 Posts - Basic Pay 9300 Grade Pay 4200 in Pay Band II category - Diploma in Civil Engineering with 2 years experience - Age 30 years. Junior Engineer Electrical - 58 Posts - Basic Pay 9300 Grade Pay 4200 in Pay Band II category - Diploma in Electrical Engineering with 2 years experience - Age 30 years. JE Civil : OA / OL / BL / HH (Required capacity : Sitting / Standing / Walking / Hearing / Manipulation of fingers / Seeing / Reading and Writing / Communication).